You tell us your Dream of a holiday, we create it for you. Cycle 550 kms, climb 11 Legendary Tour de France cols. The Moutain the pros respect. Ventoux will fight you, mock you. ...in Sunny Locations. Improve your cycling and test your limits riding in the most iconic cycling locations in the world. 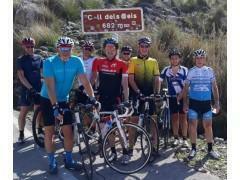 Our Mallorca Cycling Holidays &Training Camps will help you cycle further and faster. Our expert cycling coaching and knowledge of the island will see you develop base miles, fitness, and technique, training on the same roads as Team SKY. Reach your next level in cycling! Our cycling challenges take you to France, and Mallorca, riding iconic routes such as ‘La Route des Grande Alpes’, competing in sportives such as Marmotte Granfondo Alps, Marmotte Granfondo Pyrénées, and the Mallorca 312, and or taking on mythical cols such as Mont Ventoux and Alpe d’Huez. Test your limits like a pro! From 499 €/pps/ week, hire bike included. Benefit from structured training rides designed to boost your fitness, bike skills, and base miles. Don’t Miss this amazing offer. 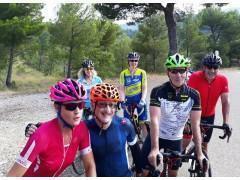 Mallorca Cycle Training with a Legend! Improve your cycling in Mallorca, the cycling paradise! Join us on structured training rides, receive pro coaching advice. Ride with The Legend Sean Kelly – 196 Pro victories. Suitable for all levels. Don’t Miss the Early Bird price! Savour your achievement as you conquer four major Alpine cols in one day. Starting with Glandon and finishing at the summit of Alpe d’Huez this is your Tour de France stage. Ride fully supported like a Pro. We take care of logistics, you ride the cols! Test your cycling skills on cols used in the Vuelta and Tour de France. Savour the views, savour the challenge, ride fully supported. Tourmalet, Hourquette d'Ancizan, Aspin, & Hautacam feature challenging climbs and thrilling descents. You know you must ride this sportive! What a great cycling year 2018 turned out to be. We loved it so much we put together this little video to celebrate. Thank you for making the last year so good! Sa Calobra or Coll dels Reis in Spanish has become one of the most famous Mallorca cycling climbs. The ride features 26 tightly packed hairpins that come at you thick and fast. The average gradient is just under 7% and the climb is around 10kms from sea level. Recently, Flora and Martin took on the challenging yet majestic sportive of Marmotte Granfondo Pyrénées. The Mont Ventoux challenge 2018 has begun. Over the week, our riders will take on the ‘Beast of Provence’ from two sides: Malaucène, and the infamous Bédoin route. Both routes provide challenges and wonder. Mont Ventoux has to be attempted at least once in your cycling career. Cycle training on open roads presents dangers no matter how cautious you are. Traffic tends to be everywhere and most routes have plenty of blind spots. Cycle lanes are great when they have been positioned well, but not all car drivers seem to take notice of them. They made it! Geneva Nice Stage 6 saw our riders complete the final leg of their holiday. Here are some pictures of their magnificent achievement. Stage 5 of Geneva Nice is exciting. It features the mighty Col de la Bonette, at 2802m altitude, it is the highest through road in Europe. Col de la Bonette, 24kms of ride. At 2802m this is the highest through road in Europe! Stage 4 of Geneva to Nice featured an iconic Tour de France climb: Col d'Izoard! This hors catégorie col has seen legendary Tour de France battles. In fact, the two of the sport's greatest riders are honoured: Fausto Coppi and Louison Bobet. The tour saw our riders take on two Tour de France cols: Télégraphe and Galibier! The latter is an hors catégorie climb of 18 kms and an altitude of 2646m. Not an easy climb but one if the most scenic in the Alps. Télégraphe 12 kms, 6% gradient. Galibier 18 kms, hors catégorie, altitude 2646m!